Grab the Scavenger Hunt code. Photo Theme. Join the blogroll. Visit participants. I had so many to choose from…but settled on this. I love how the sun was hitting the water spraying from the sprinkler! That is a super photo and great choice. I used to run through sprinklers like that one – it was really hot in the California summers! I used to spend hours running in the sprinkler. Now my son puts our sprinkler under the trampoline. It’s great to watch the water droplets bounce. I love the way the spray is caught in the sun. Gorgeous! 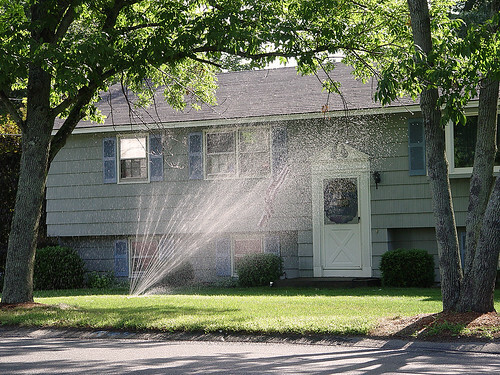 We had some pretty great times running through sprinklers when we were kids, didn’t we? Ohhhh…one of my favorite things to do in the summer when I was a kid. I lived running through the sprinklers and even more so seeing how the sun made the spray and drops glisten… even sometimes make tiny rainbows…Lovely photo! It is almost water sprinkler season isn’t it… how time flies whether you are having fun or not!!! Great choice. That brings back memories! Sprinklers are not allowed here any more – drought and water restrictions. perfect picture for a hot summer day!!!! I want to run thru! This is a nice choice for the Water theme, something different from most of the water photos. I love that too; if lucky you can get a rainbow! Great shot of the water sprinkling through the air!